Fish bones smaller than a fingernail have a big story to tell. 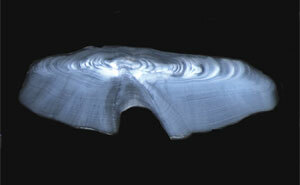 Known as otoliths, they grow slowly, adding a new layer year by year. Scientists at OSU’s Hatfield Marine Science Center are analyzing rockfish otoliths in combination with tree rings from the Cascade Mountains to shed light on how climate changes in tandem on shore and at sea. Black is working with George Boehlert, center director, to examine the effects of ocean conditions on fish growth. Their analysis of the climate-growth relationship clearly shows that rockfish grow best in cool ocean conditions with plenty of upwelling, especially in winter and spring. The tie between ocean variability and fish growth is as strong as the relationship between temperature or precipitation and tree growth in many tree ring studies, Black points out. “The strength of the correlation is surprising — and encouraging,” he says. The story gets even more interesting for scientists when they compare the rockfish chronology with tree-ring chronologies from the Cascades. “We see a strong inverse relationship between rockfish growth and tree growth,” says Black. When ocean conditions are warm, the winter is less severe, and the growing season for trees in the Cascades starts earlier and lasts longer. Tree rings become wider, not narrower — just the opposite signature from the rockfish. “The inverse connection between tree growth at 5,000 feet in the Cascades and rockfish living hundreds of feet below the ocean’s surface shows the enormous influence of climate in both the marine and terrestrial ecosystems,” adds Black.